Is Hughton after James Vaughan to make up for injured strikers? | NUFC Blog. Is Hughton after James Vaughan to make up for injured strikers? We’re somewhat bereft of strikers at the moment with Ameobi definitely out due to a foot injury and question marks over the fitness of both Carroll and Xisco. 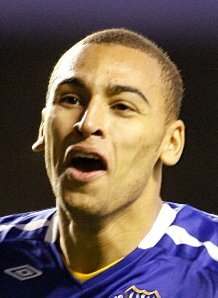 The Mirror is reporting that Hughton has asked Everton if he can have James Vaughan on loan to plug the gaps. Vaughan is Everton’s youngest ever goalscorer but has been fairly injury-hit himself. He’s fit now but has found himself warming the bench a lot and is apparently keen to see some first team football somewhere. The Mirror says that Moyes will think about it and give Hughton an answer over the weekend but it also says that Hughton has other targets too. “As far as Shola is concerned, we must stick to the factual stuff. “What he’s got is a stress injury to the bone, which is being assessed today by our medical team. “We will see what the extent of the damage is. “But we remain very hopeful that this is not a long-term injury. “There’s a possibility Andy will miss Monday night. “We didn’t play him against Palace or Huddersfield. “I’m very hopeful Joey will be fit for Monday. “He’s very much touch and go. “If he’d started against Huddersfield, he could have aggravated it. And of course Jonas has a groin injury, as does Xisco apparently. Fortunately we have 13 day break after playing Leicester on Monday with our next match being an away trip to table-toppers Cardiff City on Sunday 13th Sepetember. Hopefully that break will give some of the injuries a chance to heal. Vying for No.9 at Newcastle United? – Part Deux. Taylor to commit to future on Tyneside? Toon’s ‘Boxing Day Jinx’ continues! Handy Andy pulls no punches for Newcastle! A Goal-every-six-games striker who’s also injury-prone to replace other injury-prone strikers? Mind you the drop in level could work for him and he seems to be fit now. BBM, I suppose we have to appreciate that Hughton’s options might be limited to strikers that other clubs are prepared to loan out. Bowburn, that’s a very unfair assessment of Vaughan. He would probably be a good addition to the squad. Why is unfair. It’s only based on the evidence I’ve seen and the facts speak for themselves. I did follow it up with a more positive outlook anyway.